An amazingly-well preserved Bald Cypress forest has been discovered off the coast of Alabama, offering scientists a glimpse at the distant past. When you imagine a forest, you're likely thinking of a group of trees. Maybe a few bushes, some ground covering, and a deer or two. Generally this is how forests look, but what if one was completely submerged underwater? For 50,000 years? Obviously the deer would be unhappy with the situation, but you'd also expect the trees to have fallen apart, wouldn't you? And yet the one-half square mile forest of Bald Cypress trees recently discovered by scientists lying 60 feet below the surface of the Gulf of Mexico is so well-preserved that divers claim they can still smell the trees' sap when cutting into them. According to their findings, these trees have survived for so long in an undamaged state because 50,000 years ago they were buried under oxygen-free sediment which effectively froze the forest in time. 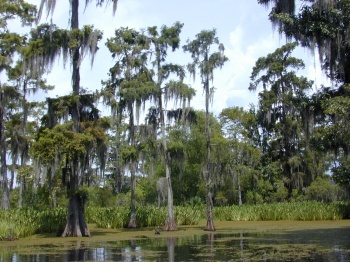 When Hurricane Katrina struck the Gulf Coast a few years ago, scientists believe the forest was uncovered for the first time in tens of millennia. This however is a double-edged sword, as while it allows the forest to be examined, it also allows marine life the opportunity to biodegrade the entire place into its floating component parts. As a result, researchers have only a few short years to properly explore the primeval foliage. The hope here is that by examining the forest, scientists will be able to glean useful information about the environment of the past. Bald Cypress trees can live for thousands of years (assuming nobody takes a chainsaw to them), and like all trees the rings that lie within their cores are very handy indicators of any climate change they may have survived. Fortunately for scientists, this particular forest is full of huge Bald Cypress tress. "These stumps are so big, they're upwards of two meters in diameter - the size of trucks," says University of Southern Mississippi dendrochronologist Grant Harley. "They probably contain thousands of growth rings." LiveScience has a full feature on this discovery that we urge you to read. The tale of how scientists found these trees is entertaining enough by itself, and the science is captivating as well. It's not exactly "DNA-rich mosquitos trapped in amber" exciting, but give these scientists a break. It's not like they could tell you about America's secret dinosaur army even if they wanted to.